(Reuters) – Apple Inc CEO Tim Cook on Wednesday acknowledged widespread disappointment in the company’s sagging share price but shared few details about its secretive product pipeline and touched only briefly on a raging debate about how best to reward shareholders.The world’s most valuable technology company headed into its annual shareholders’ meeting at its headquarters on shakier ground than it has been accustomed to in years, since the iPhone and iPad helped vault the company to premier investment status. A declining share price has lent weight to Wall Street’s demand that it share more of its $137 billion in cash and securities pile – equivalent to Hungary’s Gross Domestic Product, and growing – a debate now spearheaded by outspoken hedge fund manager David Einhorn. Einhorn was not spotted at the meeting at the company’s headquarters at 1 Infinite Loop in Cupertino. Cook repeated that the company’s board remained in “very very active” discussions about options for cash sharing, and said he shared investors’ dissatisfaction over the stock price. “I don’t like it either. The board doesn’t like it. 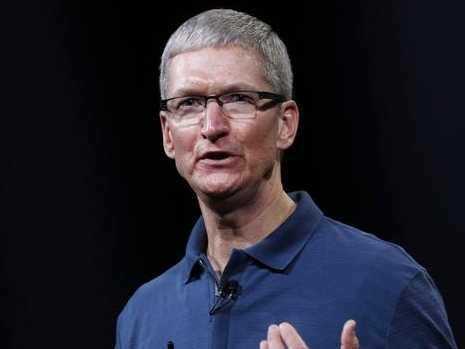 The management team doesn’t like it,” Cook told investors. By focusing on the long term, revenue and profit will follow, he said. Apple had the “mother of all years” last year with growth, in terms of dollars, outpacing that of Microsoft Corp, Google Inc, Nokia and several other major technology companies combined, Cook said. Cook — who was re-elected to the board with 99.1 per cent of shareholder votes — added that the company was working on new product categories, but, as usual, would not elaborate. Apple’s stock was down 0.25 per cent to $447.86 in afternoon trade. It is now down more than 35 per cent from its $702.10 September peak. Cook presided over Wednesday’s staid affair in his typically even-keeled manner. Despite a slipping share price, dissatisfaction on the Street over its cash allocation and uncertainty over its product pipeline, shareholders re-elected the entire board, and Cook won more than 99 per cent of the vote in preliminary results. Cook got the most votes, followed by Walt Disney Co’s Bob Iger, who won re-election with 99 per cent of shareholder votes. Former Avon Products Inc CEO Andrea Jung, who stepped down after botching several attempts at restructuring the cosmetics company, received the fewest votes of the group, with 84.6 per cent of shareholders voting yea. Carol Shoaff, an Apple shareholder for about the past five years, said after the meeting that she was confident in Apple’s leadership and the company was on the right path. Members of the Service Employees International Union protested outside the headquarters to get Apple to reconsider hiring of securities contractor SIS. Apple’s annual shareholder meetings have seemed more like celebrations in recent years. Since the company came out with its first iPhone in 2007, the company multiplied in market value until it peaked in September. Then Samsung Electronics and Amazon.com Inc began seriously eroding its market share in 2012, powered by arch-rival Google Inc’s Android software. On March 14, Samsung will launch the Galaxy SIV smartphone, the latest iteration of a flagship smartphone that helped it dethrone Apple from the top of the industry. Institutional investors want Apple to share a greater chunk of its cash and securities pile, a demand growing increasingly strident with the company’s stock wallowing at levels untested since the start of 2012. Einhorn is advocating “iPrefs,” preferred stock that will carry a perpetual 4 per cent dividend to boost returns while not hampering cash flow. On Friday, Einhorn won an important legal victory that strengthened his hand. His Greenlight Capital secured an injunction that invalidated shareholder voting on a proposal to scrap Apple’s power to issue preferred stock at its discretion. Apple says this would enhance governance. But the hedge fund manager argued it could complicate efforts to issue preferred securities in the future. Cook said again on Wednesday that Einhorn’s lawsuit – regardless of its efficacy – was a “silly sideshow.” The underlying principle of cash distribution was something he and the board took seriously, he added. The proposal was not put forth on Wednesday but Apple shareholders and representatives from the California Public Employees Retirement System and the Nathan Cummings Foundation spoke in favour of it at the meeting. CalPers, owner of 2.7 million Apple shares, had supported the so-called Proposal 2. Senior Portfolio Manager Anne Simpson said it was unfortunate the measure could not be put forward. Cook, who took over from late company co-founder Steve Jobs in 2011, answered a variety of questions from shareholders, including some on Apple’s new headquarters, labour conditions in its factories and product plans. One shareholder also asked why there was no bathroom in an Apple retail store in Santa Monica, Calif. Cook, acknowledging that it was an important point, said he will look into it. On the new headquarters, Cook said the company plans to break ground later this year and occupy the facilities in 2016, a delay from the original 2015 target date. The meeting largely followed the script with no distractions. Shareholders voted down two shareholder proposals, both of which were opposed by Apple’s board. One wanted Apple leadership to hold more stock, the other was a proposal to create a board committee on human rights.